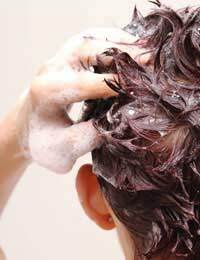 Most people believe that changing shampoos regularly is a good idea. The reason? They believe that shampoo build-up is not good for hair and that it can leave their locks heavy and lifeless, without either volume or shine. Changing or rotating shampoos weekly or even daily, they reason, is better for their hair. Many shampoos become less effective with regular use, they say, so switching from time to time is a tried-and-tested way to keep your hair looking good. But now dermatologists are saying that switching shampoos too often can be bad for your hair, as it can cause the skin conditions scalp dermatitis or seborrheic dermatitis - which in some cases can even result in hair loss. So should you regularly switch shampoos – or should you find a good one, and stick with it? Scalp dermatitis is a condition of the skin on the scalp. Usually it presents itself by making your scalp itchy, red and irritated, and is sometimes accompanied by dandruff, or flakes of skin that fall off and often become noticeable. Changing shampoos often is one reason why people develop scalp dermatitis, because their skin becomes irritated by the shampoos they use. This is often because shampoos contain perfumes, artificial colours and other ingredients which can irritate the skin. Many other triggers can also exacerbate scalp dermatitis, including changes in humidity, stress, trauma such as excess scratching on the scalp, and even a change in seasons. It might start with minor dandruff in specific areas but in some cases the entire scalp may become affected. It is estimated that about 15 – 20 percent of the population suffers from dandruff. Another type of common scalp dermatitis is called seborrheic dermatitis, which is characterised by yellow or white patches on the skin, not only on the scalp but sometimes on the eyebrows as well. This can be treated by topical applications, which usually are prescribed by a dermatologist. In rare cases, seborrheic dermatitis can result in hair loss. The reason for this is because the sebaceous glands can attach itself to the hair follicles, causing a very rich type of sebum to form. This sebum triggers a proliferation of yeast in the hair, which causes your scalp to become even more irritated. If hair follicles are in the area where the irritation occurs, they find it an unhealthy place for hair to grow, and so hair will not flourish in that specific area. Although this skin condition is not an infectious one, over the years it can result in diffuse, albeit temporary, hair loss. People who find this the case may benefit from sticking to a special shampoo for a minimum of three months, either an anti-dandruff shampoo or a stronger shampoo designed for people with seborrheic dermatitis prescribed by your GP. Usually, this will result in the hair eventually growing back, although topical medications may also be needed to clear up the condition completely. People who have Parkinson’s disease or HIV may find their seborrheic dermatitis is worse. Please note that hair loss can be exacerbated in people with seborrheic dermatitis if the condition is itchy and unpleasant, causing it to be picked at. People who have seborrheic dermatitis may also suffer from genetic balding, so it’s important to find out exactly why your hair is thinning before you decide on proper treatment. People of both genders, although men are more likely to suffer from the condition than women. Adults, with the condition peaking at age 40 and usually occurring for the first time around puberty. Babies with the condition don't have seborrheic dermatitis but suffer from what we call “cradle cap”. Children who have dandruff probably have a fungal infection. People who take specific medications, which can induce the condition or cause it to flare up. If you think this might be the case, speak to your doctor to rule it out before getting other treatment. You may need to change your medication. In general, people who want to have healthy hair need to listen to what their hair is telling them. If you find a shampoo that works well for you, stick with it. If you find that changing shampoos regularly has no adverse effects on your hair and helps keep up hair volume, go with that. If, however, you discover that regularly changing shampoos is causing your scalp to become irritated and itchy, or if you are suddenly experiencing hair loss accompanied by itchiness or redness, it might be time to see your GP. In many cases, buying a special anti-dandruff shampoo and sticking with it for a minimum of three months may be the answer to scalp dermatitis, and may even reverse minor hair loss. @Sarah - oh dear. Dove is supposed to stop all of that too. Can you not use a moist-hair conditioner on top of the Biotique product? After experiencing major hairfall, i switched from Dove shampoo to Biotique anti -hairfall shampoo. Biotique stopped hairfall but made hair super dry. When i tried switching back to Dove shampoo, it caused severe irritation and itching in the scalp. Now i m stuck with biotique. Hey it's nice to read your suggestion So can you also suggest me as my hair is little bit dry and non shiny and ya my plus point is that I don't have much hair fall like at the time of washing or combing only three fours came out SO which shampoo should I try Presently I bought Himalaya protein shampoo and earlier I was using sunsilk . I was using a shampoo for almost 2-3 yrs than due to some traveling and stuff I had to make use of another shampoo and then after I used another shampoo due to which my hairs were extremely rough and then atlast after lot of thinking I switched to my previous shampoo... Alas but after only one use I m feeling like that after that wash my hair is again dry and fizzy...Gosh it's hell irritating.. .. I dont know what to do the shampoo which was one of my favorite one is now not working out or is it just that Ishould wash it more to observe the rest washes of my hairs.. ... Please can you help me getting out of this problem.. ..
@aaaaaa - Head and Shoulders is the off the shelf brand that is popular. Ask your pharmacist too - who will be able to recommend something. If it is really bad consult your GP.